Well the time has come, I am finally revealing our French Farmhouse kitchen that we started making over back in the spring. I know, I know it took me awhile and I apologize but there were a lot of little projects that I wanted completed before I shared. I hope that you find it was worth the wait. We started off with a very dark builder grade kitchen. The dark granite, dark cabinets, and the dark paint color made me feel like I was in a cave because the space is not very large. Our kitchen was my least favorite room in the house! I dreamed of a lighter and brighter kitchen. We thought that maybe changing out the granite would be the answer but after pricing it out we realized we needed to come up with a more budget friendly plan. That is when The Hubster finally gave in to the idea of me painting the cabinets and then that led to changing out the back splash which led to...well you get the idea. In the end we are both in love with how it turned out! The original plan was to paint the top and the bottom cabinets but I decided to keep the bottom half as is. It is a happy medium because I love light colored cabinets and The Hubster loves wood. We choose a travertine subway tile as well as a travertine/glass tile for the accent. It was very easy to install. We do NOT regret for one minute taking our huge microwave down from above the range. We knew as soon as we took it down it was not going back up. The corner here was always wasted space but makes the perfect spot for our new microwave. 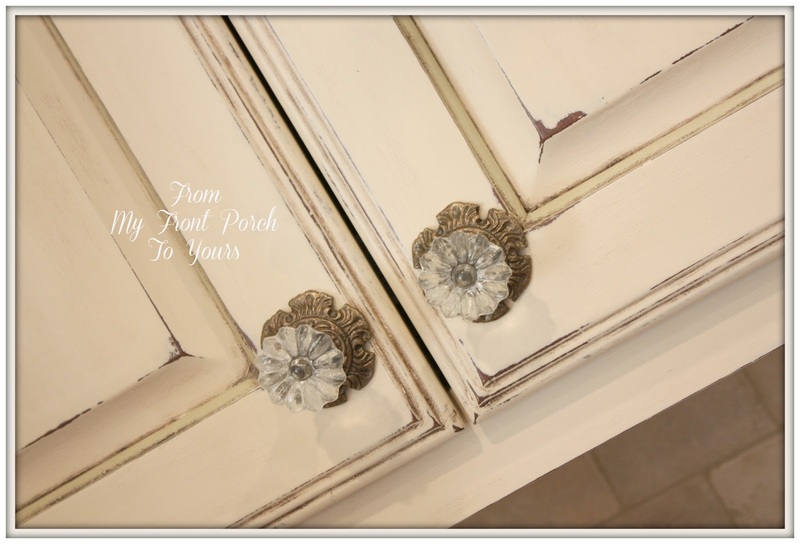 I added beautiful glass knobs to our top cabinets. I also changed out our drawer pulls to ones that have similar coloring as the cabinets. The island was my inspiration piece in the room. The Hubster and I transformed it a few years back and I was not wanting to paint over it nor was I wanting to get rid of it. If you wanna see what this island looked like beforehand click here. 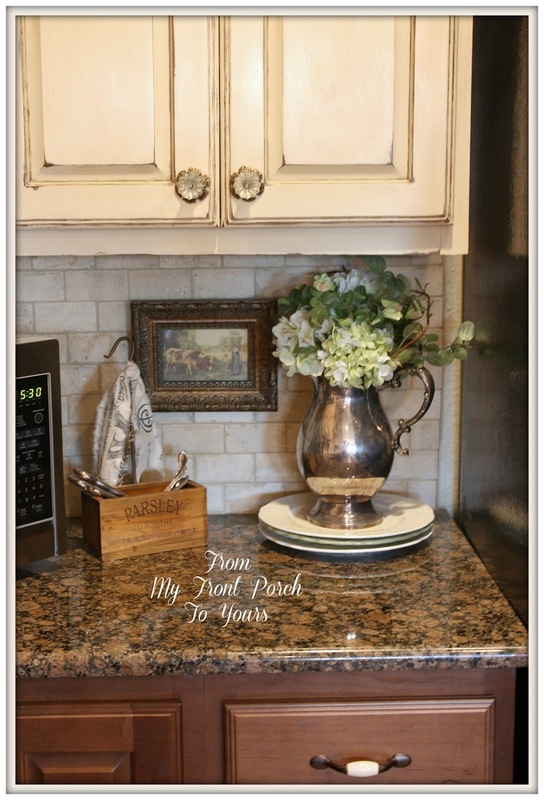 If you missed how I achieved my kitchen cabinet finish click here. To see Part 2 click here. Gorgeous! Love the color and leaving the bottom dark, so pretty! So pretty. Love the color of top cabinets...I really have been wanting to do this in our kitchen. These are the push I need to move forward. Just lovely! Your kitchen is gorgeous and worth waiting for, it is stunning. I know you love to cook in that beautiful kitchen. Congratulations on your beautiful kitchen. Totally worth the wait! It's is so pretty now! Going back for a second look! Absolutely BEAUTIFUL! I love all of it! Keeping the dark cabinets on the bottom was a nice way to add visual interest but I like the fact that you treated the tall "oven cabinets" all as a single cabinet from the floor to the ceiling. The glass knobs are still my favorite! 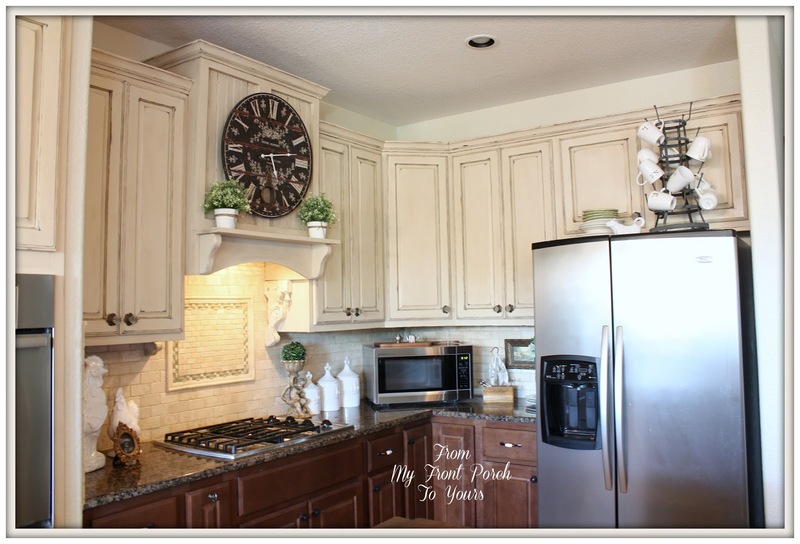 Pamela...I cannot believe what a difference just the cabinets you painted made!! Good grief! LOVE, LOVE the backsplash and I agree with you about the micro...when ours caught on fire and we took it out, it never went back. Love how the cooktop area looks now. Love your glass knobs too, and the chandy. It looks fabulous!! BEAUTIFUL!! I truly enjoy your posts...you inspire me to get going with things I want to do around my house! Beautiful!!! My hubby loves the wood too..but I want brighter. Can't wait to show him your compromise! So awesome...can't wait for the next round of pics! Thanks for sharing! Love your kitchen transformation ! So much better ! Taking the microwave down makes such a big difference ! Can't wait to see the rest ! Love it!! The clock caught my eye and then I started seeing all the pretty details like those divine knobs! Do you sometimes just stare at it and smile? You did a great job! Stunning Pamela!!! Love those corbels and the backsplash. Job well done my friend. This is absolutely beautiful Pamela. Great job and so worth the wait. Toooooooo pretty. All your touches are wonderful. Beautiful. I have the biggest smile on my face!! I just adore it!! I always feel so happy when other people get joy from things like this! I adore the two toned kitchen. 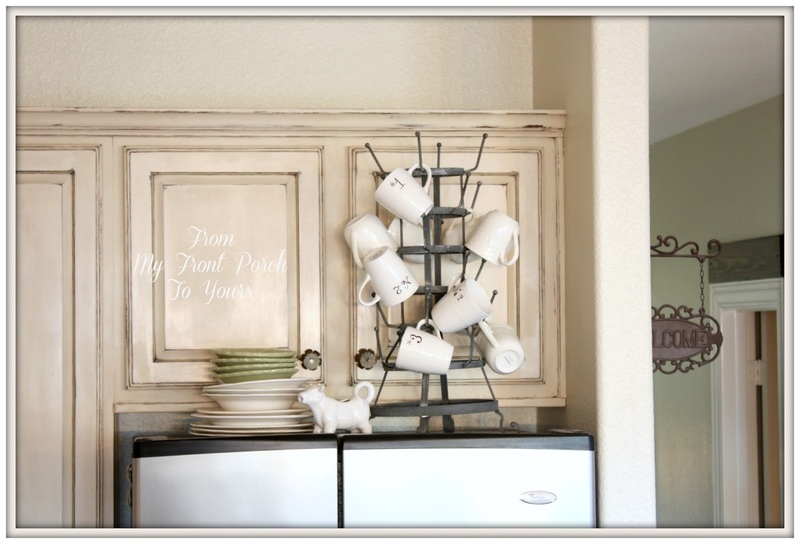 I felt the same way about mine--my husband didn't want to paint the cabinets, I did--but in the end it fits us perfectly. I just feel the love ya'll poured into your kitchen!! Here's to many good memories created in your beautiful space! It looks beautiful, Pamela! You did a great job. Love the backsplash tile and the painted cabinets. The microwave can be tricky to deal with, but we can't live without them! I've had it both ways ~ over the stove and on a counter in our two previous homes. When we moved here we both just felt over the stove was better for us. Love your island! Glad you didn't paint that as it looks so pretty as it is. It's absolutely beautiful! I know that must have been a million hours worth of work but it was so worth it. Between your kitchen and that pool, you must be in heaven. we have similar elements to our kitchen!! 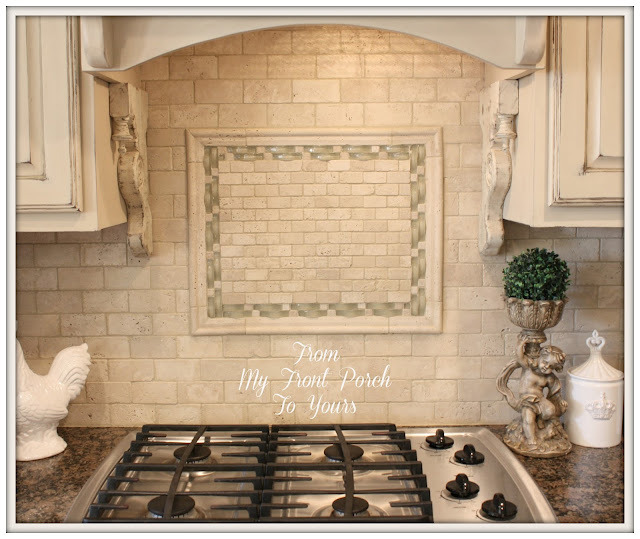 Our backsplash tile over our stove is almost identical :) And our kitchen cabinets were that same color with the same wall paint. It looks wonderful, and I know all that hard work will be so enjoyed by you and your family!! Wow!! It looks fantastic! 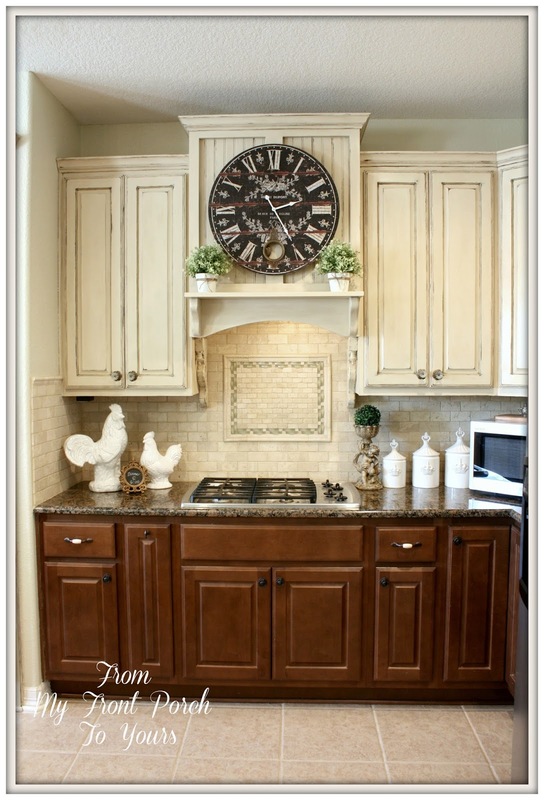 Love the combo of painted and wood cabinets, and the hood with the corbels. Beautiful job! Can't believe those glass knobs came from HL... they look vintage. Enjoy!! SO beautiful! All your hard work really paid off. WOW!! Pamela it looks fantastic! I love the new back splash, I love that you left the lower cabinets dark, I love that you removed the overhead microwave! All wonderful choices! Wow, wow, wow!! It looks so amazing Pamela! I just love it! Such a beautiful kitchen and you did it yourself! Bravo! man oh man your kitchen looks amazing Pamela! Stunning. I love how the cabinets turned out and I love the island. Good job to you and the hubs for all your hard work. It sure paid off!!!!!!!!!! Oh my gosh Pamela! Your kitchen turned out amazing! What you did above your cooktop is sooooo awesome. Seriously. You must be so excited and proud of what you've done. I would love to paint my cherry kitchen cabinets, but I'm not brave enough. I am going to start off by painting the cherry cabinets in the laundry room and will go from there. This former kitchen designer says that you did an outstanding job! it's absolutely beautiful Pam. You should feel so proud of your kitchen you guys did a great job. I don't believe there are words that describe just how much I love it!! It turned out amazing! Great work friend, you should be feeling so overjoyed with your work. Big hugs to you!! Have a wonderful weekend! Oh my!!!! Pamela, your kitchen looks AMAZING!!!!! You did such a beautiful job! Love the transformation! Pamela, Your kitchen looks fabulous! I've been trying to get my husband to let me paint the kitchen cabinets to no avail, so far. I love how you kept some stained and painted others. Looks great! Wonderful job! Love your kitchen to bits!!!!!!!!!!!! I love it! 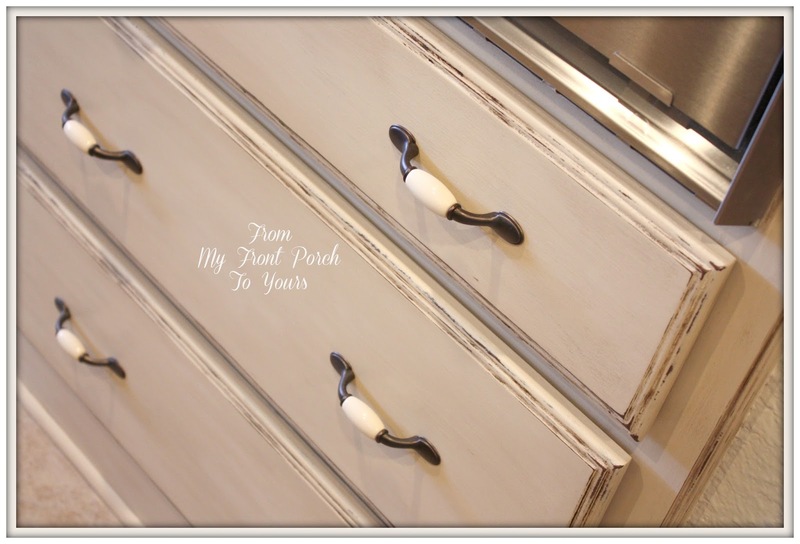 Love the combination of painted and wood cabinets...it is perfect! 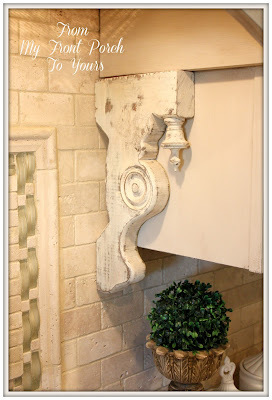 I was just pinning pictures of mantels over ranges and discussing taking down our over the range microwave with my husband and here are your pictures. I love everything you did. Great job...enjoy!! absolutely gorgeous!!! love the distressed lighter paint color on the top. you all did a wonderful job!! What a beautiful transformation,,, and you did it yourself! Kudos to you and you husband! I love the the area over your stove and the mantel. I had to look and figure out that you kept the cabinet there and turned it into a lovely place to display things. I thought you got a new kitchen hood all together. Fabulous job! I really love the top light and the bottom wood. Not only a compromise but a great design choice! Oh wow...I love everything you all have done!!! Those glass knobs with the back plates did it for me...I am in love!!! This kitchen looks so similar to ours in our brand new house. We don't have the arched doorways, though- LOVE those. Yes, I see how we could get rid of the micro over the stove beautifully! We actually have those door pulls in the master bath! I really love the warm tradition of the wood, but I am soooo inspired by the division of space with the painting!! Our house is very craftman style so there would have to be modifications, but the wheels are turning! Thanks! Love love love!! I love how you left the bottom cabinets dark and I love the beautiful mantel you made over your range! You guys did and awesome job Pamela...can't wait to see part 2! Your before kitchen was pretty darn good, but the after is fabulous! I love it! Wow, Pamela, I love it all. Great paint job and love the subway tile. Bravo! Worth every agonizing minute of the wait! Pamela, it is beautiful!! Can't wait for part 2. Beautiful job. Love every bit of it. 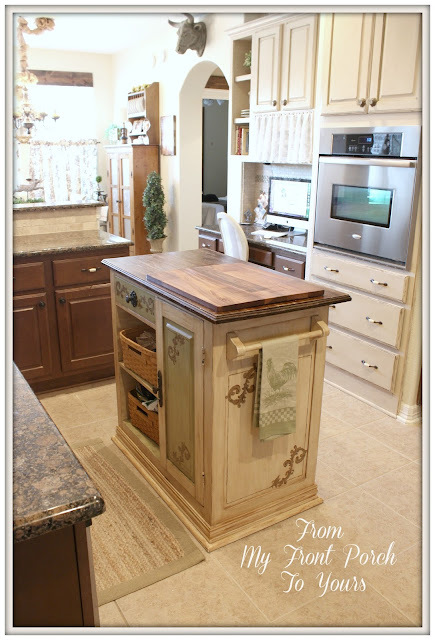 I would have never thought of leaving the bottom cabinets in wood and painting the top ones. They look so well together. And it brightened the room so much. 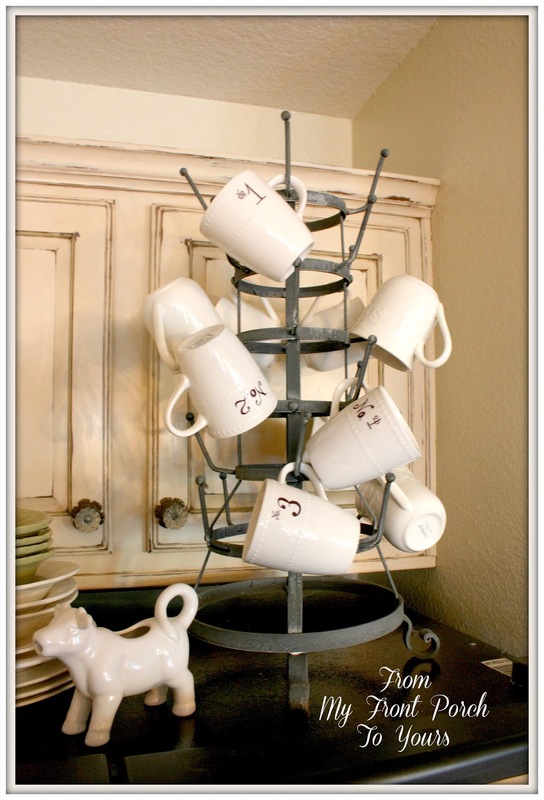 I think I am going to show your kitchen to my hubby and try to talk him into letting me paint my upper cabinets. I wanted to paint mine a few years ago as our kitchen is facing north and has just one small window and a door leading to my computer /sewing room. The only time ours gets sun shine in the kitchen is late afternoon when it can come in through the window in the sewing area and through the doorway to the kitchen. The kitchen always looks dark in the winter. It sure would brighten ours to do at least the top cabinets. Amazing kitchen full of inspiration! Well done, Pamela!!!! Your kitchen is gorgeous, I'm in love with everything you did...You did a great job. It´s so beautiful! I love your kitchen! It makes a huge difference, so much lighter and so much more personality! 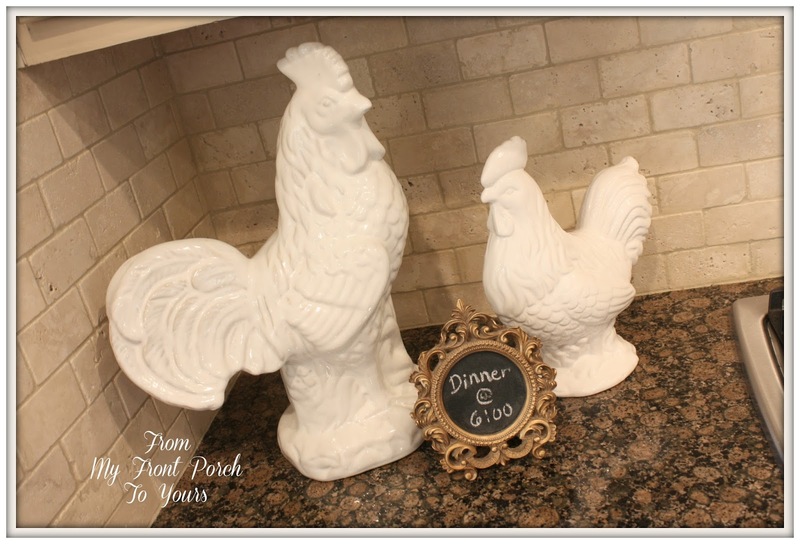 Your kitchen turned out beautifully Pamela! 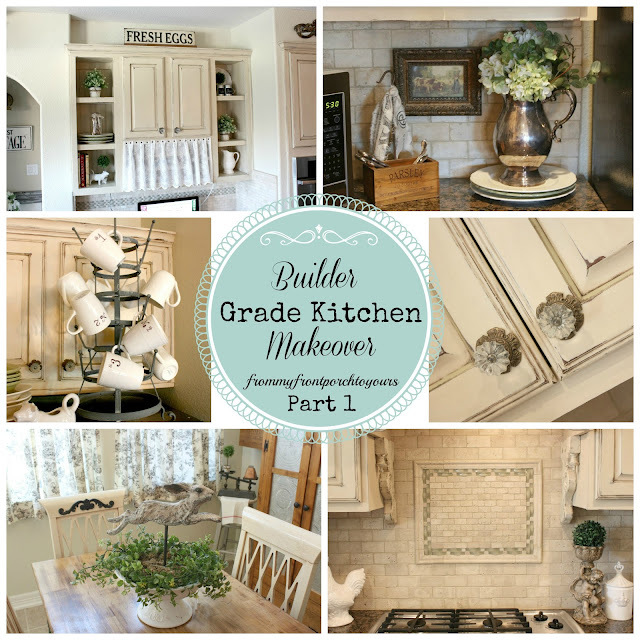 I love how you kept the darker cabinets on the bottom and the painted cabinets and island are gorgeous! So many wonderful details, especially those pretty knobs and your chair! Gorgeous! 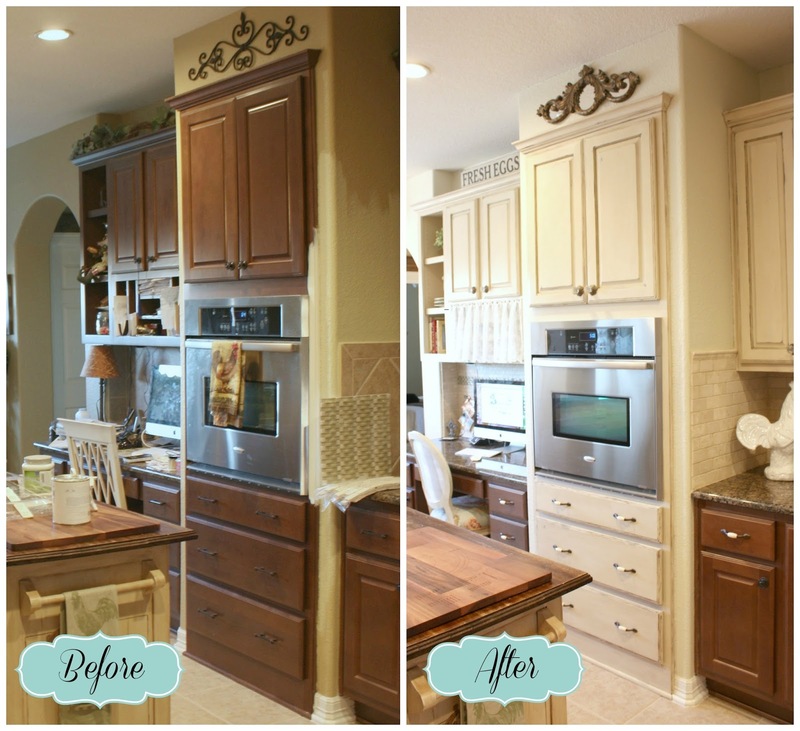 I love love how you kept the darker wood lower cabinets and lightened things up with the painted upper cabinets. So pretty, Pamela. Such great details right down to the glass knobs and the pulls that compliment both cabinets. Your kitchen was very nice to start with but really suits your style now. Pamela, this is stunning! I love every inch! You did an amazing job on painting the cabinets and installing the tile! Your attention to detail is amazing! Pamela your kitchen looks gorgeous! Wow love how you painted your cabinets and I love your new hood! 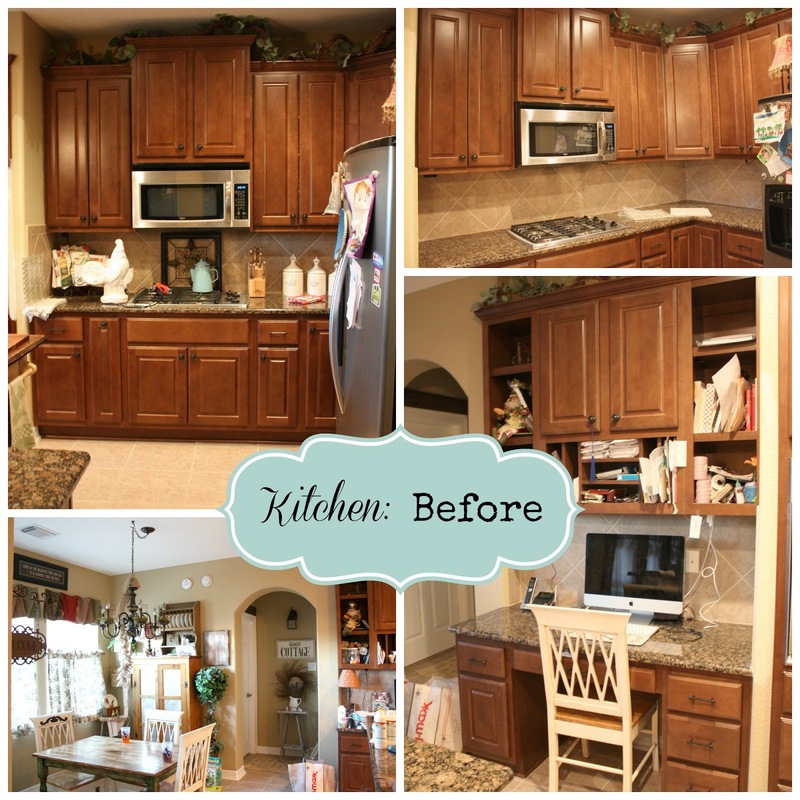 Wow..i loved your cabinets before but now they look even better. I am in negotiations with my hubby in trying to refresh our tired 20yr old kitchen oak cabinets. He wants wood, i want tp paint...now i can show him how beautifully you blended the two. I also love the tile you picked. Thanks so much for sharing your gorgeous kitchen! Just gorgeous, Pamela! I love the mix of painted and wood cabinets and the stove area looks amazing after taking away the microwave. Such a beautiful transformation! Pamela, your kitchen is gorgeous! 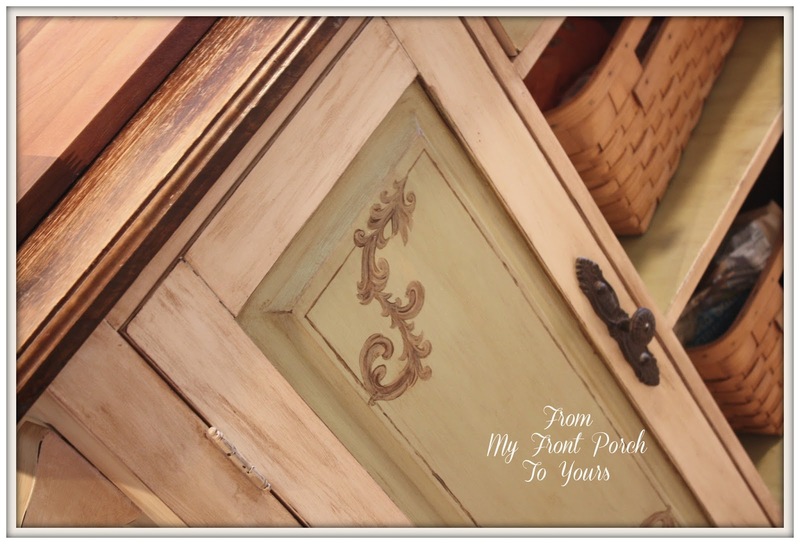 I love the mix of painted and wood cabinets as well! The glass knobs are gorgeous! I agree with you about removing the microwave, it really opened the area up and made a focal point with the beautiful time! great job! And I think your granite looks wonderful in your space - not sure why everyone wants to rid themselves of such classic and timeless upgrades, glad you didn't! Pamela, The transformation is amazing! I love all of your choices and I appreciate you sharing your beautiful kitchen at the Open House party. Oh my Pamela...the kitchen is phenomenal...Love it!....you and the hubster did a spectacular job!...truly an amazing transformation!!! You did a beautiful job! The color is so soothing. 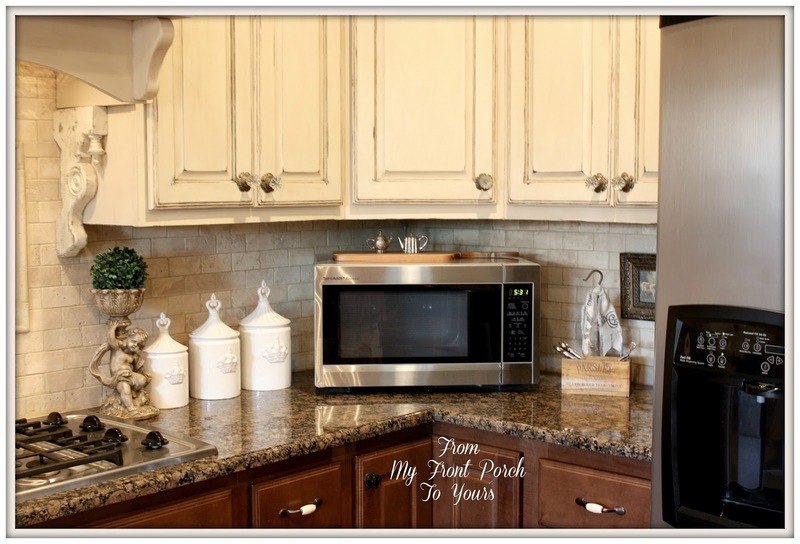 Your kitchen looks beautiful, I love the contrast of the cabinets. I know you love cooking now, and I'm sure it was worth the wait. Beautiful, Pamela! 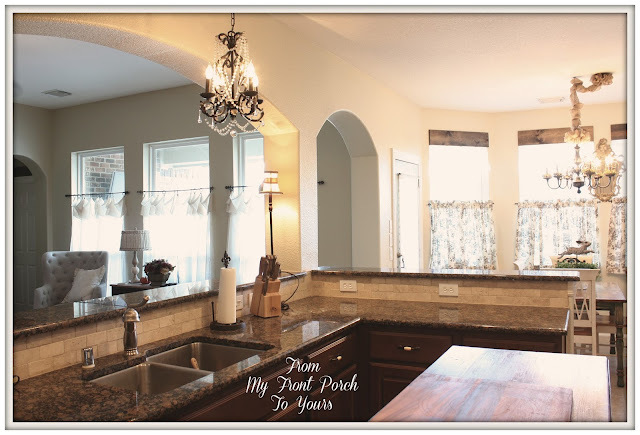 I really like that you only painted the upper cabinets and kept the lower ones dark -- very sharp! Hi Pamela. just wanted to say how much I enjoy your blog. Your a big inspiration and it makes me want to redo my whole house, especially the kitchen. I went out to look for the wall paint color at wal-mart and home depot. But the only thing they had was autumn haze but no autumn breeze. So I wondered which one is right? If you it is Autumn breeze for sure, what store did you buy it at? Also, where did you purchase all of the accessories and little décor pieces that are on the counters and fridge. Gotta have :) Thanks a bunch! Rena I am soooo sorry!! I do not know how I missed that when proofing. Thank you for catching it for me. Yes, it is Autumn Haze and not Autumn Breeze. I can't believe what you've accomplished! WOW! Show stopper! 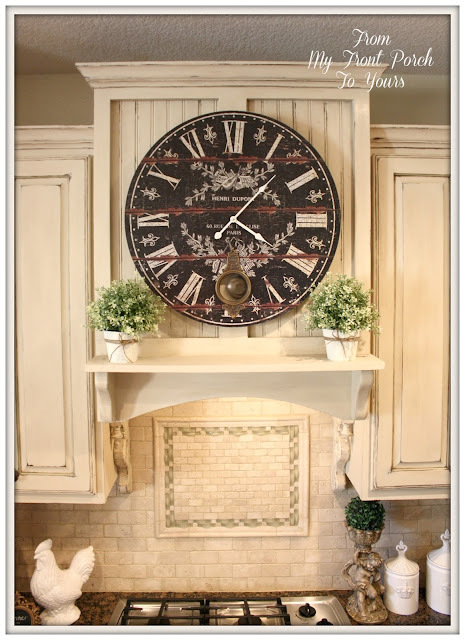 My fave is the clock, corbel, vent-a-hood area. So chic!! And your island...and hardware...all so gorgeous. Great job Pam! I love what you've done with your kitchen! The lighter color on the cabinets looks great mixed with the dark stained ones. I love the way you redid your stove area too. That makes such a great focal point. The view into the family room is so pretty as well. Great makeover!! All those pictures are so beautiful. Oh My Gosh, Pamela! Your kitchen reveal was SO worth waiting for. It's gorgeous! I am so bowled over by your cabinets every time I see them. (You could make big bucks doing that finish for others!) I don't know how I missed your island before, but oh wow! This is a really spectacular high end look and DIY remodel. I'm so impressed by the talents of you and your husband. Like I said, well worth the wait! Oh Pamela, your kitchen is gorgeous!! I love all the choices you made to give it a whole new look. I know it was a lot of work, but so worth it! You and hubby did a fantastic job!! Great makeover! So much brighter and you still have the wood to please your husband. Great mixture of light and dark. I'm sure you're loving your kitchen now. What a lovely compromise! I have been dying to get rid of the MW over my cooktop, too, so I just showed this to my husband. We'll see if he cooperates! Love painted cabinets but can't talk hubby into it. Maybe after showing him your gorgeous makeover I could! They are truly lovely. I am so in love with your kitchen. Amazingly beautiful! Oh my gosh you did an incredible job with those cupboards - just gorgeous - and the back splash ( not as easy as you make it out to be I'm sure lol ) is out of this world perfection!!! WOW!!! You and your hubby did a FABULOUS job!!! My favorite thing is the hood and mantle, I want to figure out how you did that cause I would LOVE to have that too. I love the 2 toned cabinets too, a friend of mine did that and it looks beautiful....and it's a great compromise! KUDOS to you both!!!!!!! Nice post.. You have such a fabulous kitchen and I love all what you have done. After the makeover it seems incredible and steal few ideas for my kitchen. Thanks for sharing this post and magnificent pictures. Courtney I order it back when DecorSteals had it on their site. Awesome! I would like to know how you did your hood and mantle. Is your cooktop a 30"? I love your kitchen! WE are going to do ours like this! WHERE did you get your valance that is on your window? LOVE It!! Did you make it? If so, I can't do that, but might could get the Mother in law to re create it! So pretty! How do you keep your planning desk so clean? Mine is a mess. Love your transformation! What is the name of your subway tile you used? I would love to do mine the same color! I'm just leaving you a note to let you know I was here doing some kitchen stalking. Thinking about painting half our cabinets too. Hi Nancy! If I remember correctly we spent roughly $2,000. That covered the tile and grout, hardware, paint, new exhaust fan, supplies to build new hood, the corbels and a counter top microwave. The tile was our most expensive part. It was about $600 with grout. Pamela, This is a beautiful makeover! I LOVE it! That backsplash is stunning!!! Beautiful! I painted my cabinets old ochre and have been trying to decide on a backsplash for a couple of years now. PLEASE tell me what yours are, specifically.... I have a dark drown granite with movement and everything we find seems to not blend well with either the cabinets OR the granite. I'm going crazy! Thanks! Hi J McLain! We purchased our tile from Floor & Decor. They have stores in our town. The Color of the travertine is called Crema Antiqua. It comes in the larger bricks and then the smaller as well. If you go to their website and punch in the color it will bring it up for you to see. Thank you so much for stopping by and I hope you find a tile soon! Thanks so much for the reply! Ironically, I ordered tiles yesterday. Can you believe it!? I thought maybe because the original post was so old you weren't replying anymore. Imagine my surprise this morning! Ha! After an exhaustive search for a travertine that I felt confident with, I refocused my search on subway's. I can't say that I am 100% sure I made the right decision, but after 3+ years I am so over looking for "the one" I honestly, with my inability to envision, don't know that I would have ever known it if I had it in my hot little hand! I decided to go with logic. Well, MY uneducated logic anyway. ;) I thought that with painted cabinets with slight antiquing, in a nearly beige color, I would be safe with a classic subway. While the color I ended up choosing will look monochromatic, given it's beige tones, I chose a tile made to look "hand made" with slight (I hope) imperfections to give it a little more character than an average subway and give it (I hope) a more aged, rustic feel (without being overly distracting) It also has a gloss finish where my cabinets are very matte. I hope this will distinguish it from the cabinets by simply changing the overall shine/texture. I was (am) so afraid of it looking too matchy-matchy. I'm also adding a chair rail border with, probably, a herringbone design above the cooktop to break it up a bit. I've been going with a "less is more" approach when looking at tiles but have seen a lot of subways that look like they "just need a lil some-in some-in" so I'm hoping this little change will do the trick. Since it's all the same color and tile, I hope to maintain a clean simple look. So, thanks again for the info, if I absolutely hate what I choose, I will order a sample of yours to see if it works. Your kitchen is beautiful, and inviting. Cross your fingers and wish me luck! Thank you so much for the amazing details of your kitchen. I have been searching for designs for about a year and yours is absolutely my favorite. I tend to be challenged when it comes to decorating but my mini kitchen remodel came out gorgeous with many of your ideas! The style worked perfectly and added some spark to our historic farmhouse. Hi Deb! Thank you so very much for being so kind. I am so glad that our kitchen was able to inspire you. I would love if you shared some pics with me. I dream of owning an actual farmhouse some day. My email is frommyfrontporchtoyours@gmail.com. Happy Holidays! I am using your kitchen to design/decorate our house! I love everything about the wood lowers and painted uppers! Would you happen to know the name/style of granite counter top you have? There are so many and I'm worried that the sample is an untrue representation. Thanks for your help! How exciting to be redoing your kitchen Ashley! I hope that you will share a makeover pic with me once you are done. frommyfrontporchtoyours@gmail.com As for the granite it is called Baltic Brown.